All transactions are safe and secure with a reliable history in online purchasing behind each of our associates. Buy the Twilight Forks t-shirt to own Twilight clothing and merchandise. Every Twihard knows that there are more than vegetarian vampires lurking in Forks Washington. Even though Edward Cullen does not consider humans to be food, visitors still need to watch their necks. Vegetarian vampires prey on animals for nourishment. However, Edward was not always a vegetarian vampire. For a brief time, he preyed on criminals until the guilt was too much to bear. The front of this Edward Cullen t-shirt displays the name Forks, Washington. 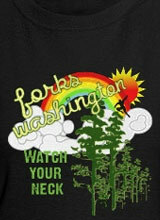 Wear this tee to represent Forks, the home of the vegetarian vampire Cullen family in Stephenie Meyer's Twilight novels. In addition to the Twilight Forks tee above, browse the Twilight Clothing Gallery for more apparel like men's and women's clothes, kids shirts or hoodies.